If you have read my site for long than you know I love quick and easy meals. Meals that can be prepared in thirty minutes or less are a must most nights in my house. Pasta is one of our favorite quick and easy meals. The other thing that you might know if you have read my site for long is that we love bacon. Bacon is the perfect addition to many recipes because it adds so much flavor. 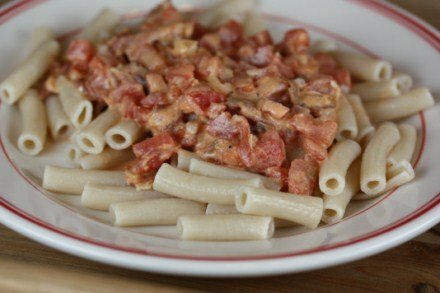 This Creamy Tomato and Bacon Pasta contains not only bacon, but also cream cheese. The cream cheese gives the perfect amount of creaminess that goes so well with the smokiness of the bacon. And the best thing about this meal is that it can be prepared in thirty minutes or less. In a skillet cook bacon pieces until crisp and browned. Transfer to a paper towel lined plate. Pour off all but a few tablespoons of the grease from the pan. Add onion to the pan and cook until tender. This will take about 5 minutes. Add more bacon grease back to the pan if needed. Once the onion is tender add tomatoes. Stir well and add bacon pieces back to the pan. Season with salt and pepper. Cook on low for 10 minutes. While sauce is cooking, cook pasta according to directions on the package. After the sauce has cooked 10 minutes, stir in the cream cheese. Stir until cheese has melted and the sauce is smooth and creamy. Serve the sauce over the cooked pasta and enjoy! Everyone needs a good list of 30 minute meals. This looks delish! Made this tonight is was AMAZING!!!! Everyone loved it!! AND it is super simply. @Laura, Wow! Thank you! I am so glad that your family enjoyed it. So I made this last night. My 12yo daughter said it was gorgeous and she loves you. Everyone else really liked it as well. I actually made it according to recipe except I added a yellow and a green pepper. I served my sauce over shredded zucchini. I was impressed with how the zucchini really had an almost pasta like feel to it. Great recipe! 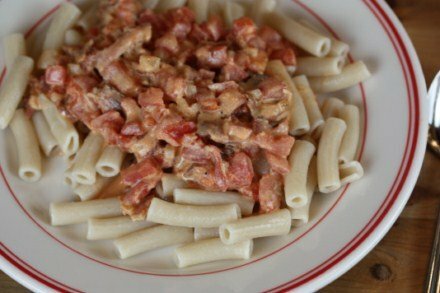 I have made this recipe twice now and my family absolutely loves it! In fact, I am making it tonight for dinner. It’s such a great weeknight meal! Thank you for this recipe! I made it tonight for my boys, and it was a big hit! I used reduced fat cream cheese and added some garlic while the onion was cooking. So easy, and usually have the ingredients on-hand. So glad that you enjoyed it! Thanks for letting me know. this was great! my very picky kids it up with no complaints!! I was wondering if you drain the tomatoes or put the juice and all in? I am going to try this tonight it sounds so good!!! I do not drain the tomatoes. I hope you enjoy it!